Der Dharmapala Yama ist Hüter der Buddhalehre mit dem Ehrentitel Dharmaraja. Zugleich fungiert er als Totenrichter. Hier ist er abgebildet zusammen mit seiner Schwester Yami. 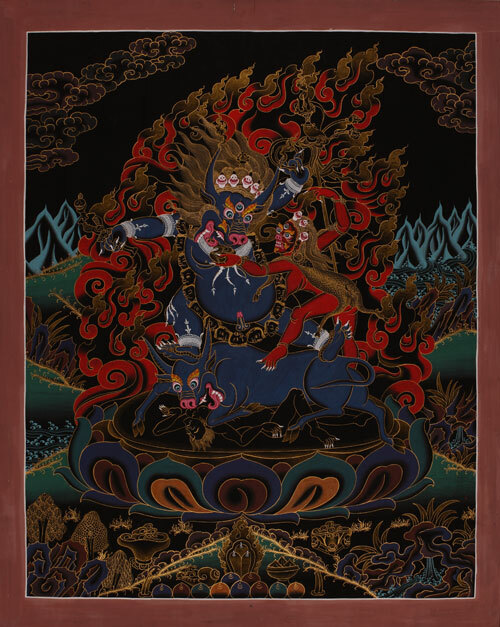 The Dharmapala Yama is the guardian of the Buddha's teachings with the honorary title Dharmaraja. He also serves as a judge of the dead. Here he is pictured with his sister Yami.